We would like to thank Kevin for sending the below photos of his 4 place kayak trailer loaded up with 5 kayaks. He choose to upgrade his axle to a 3500 lb axle with 15″ tires and also upgraded to LED lights on his kayak trailer. 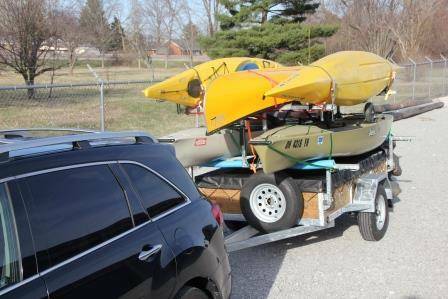 This Ohio Kayak Trailer is bound for many years of use due to its galvanized steel trailer frame and kayak racks! 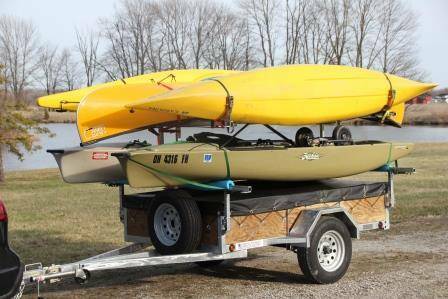 For this custom Ohio kayak trailer we upgraded the axle from a standard 2200lb axle with 13″ tires on galvanized rims to a 3500lb axle with 15″ tires on galvanized rims. Kevin went with a hinged tailgate, and customized the rack crossbars and vertical height between the two cross bars on the 4 place kayak trailer. Below are the photos Kevin sent us once he had his kayak trailer load up! Thanks Kevin! 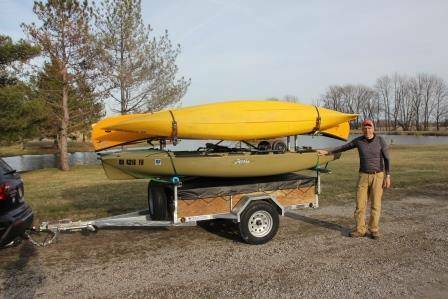 Check out Kevin’s review of his Ohio Kayak Trailer by clicking on the below link….his review is under “KMT” or read his review at the bottom of this post. I almost don’t know where to start. The design of the trailer is so well thought out. The craftsmanship is from a different era. The attention to detail is unmatched. I have an engineering background, and I just marvel at the quality and design of this trailer. You can tell that Dennis and his team take tremendous pride in their work.